Consumer grade thermoelectric coolers have been around for so long now that most people probably assume there is nothing wondrous about the discovery that makes them possible. I still marvel at the process that allows the application of a current through physical junction of two dissimilar metals (certain types) to produce a cooling effect rather than the I2R heating normally associated with conductors. 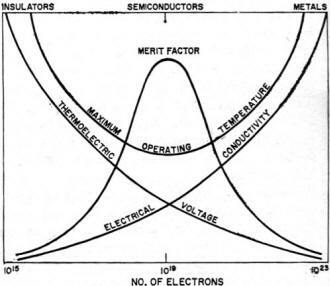 This article from a scientist at Westinghouse Electric's research laboratories provides a nice introduction to the subject of thermoelectricity from both electric current generation based on the application of heat to a dissimilar metals junction, and the aforementioned cooling effect possible from passing a current through the same junction. By Dr. John H. Kelly / Research Laboratories, Westinghouse Electric Corp.
An important new method of energy conversion which promises increasingly widespread applications for power generation, for heating, and for refrigeration without the use of rotating machinery or moving parts. Although most of us take it for granted, the conversion of energy from one form to another is essential to anything we do, or expect our machines to do, and is a concern as old as civilization itself. Indeed, the very progress of man is closely related to his ability to uncover, tap, and convert sources of energy into usable power. The quest for raw materials has involved probing beneath the earth's surface, plumbing the depths of its oceans, analyzing the microcosm of the atom, and sending out feelers to the voids of space. The search for conversion methods, while less spectacular, is not one whit less important, since all the fuel in the world would be useless without a way of using it to do some work. One of the most important forms of energy conversion involves the relation of heat to electricity, or "thermoelectricity." In one form or another, thermoelectricity is about 150 years old, but research and development in the last five years may well point to a new breakthrough in understanding and application, both in generating electricity and in products - industrial and consumer - in everyday use. Thermoelectric generators, which produce electrical power by means of heat conversion, have not, of course, replaced conventional generators, nor are they likely to do so in the foreseeable future. Yet their use to supplement or augment existing generators, is more and more indicated both by the need for additional electrical power as well as continuous improvements in thermoelectric materials and the technology needed to use them. Such devices, fired by conventional or nuclear fuels - for land-based or space applications - are constantly emerging from the nation's laboratories. Their efficiency, cost, and other related aspects appear to be favorable enough to indicate that they represent a "coming thing." A striking thing about thermoelectricity is that it is a two-way affair. Just as heat can be used to produce electrical energy, so can an electric current be used to produce changes in heat and on a scale suitable for anticipated future use in major appliances such as refrigerators. No doubt small appliances designed to take advantage of the compactness, versatility, and convenience of thermoelectricity will precede the larger products, but both types appear to be on the way. Thermoelectricity's greatest impact is expected not so much in replacing existing products, but in helping to create new and different ones. It could, for example, usher in an era of separate, independently controlled, refrigerated storage compartments throughout the home, as contrasted to the single, all-purpose refrigerator of today. The uniform efficiency of a thermoelectric cooler has a decided advantage over the conventional refrigerator in that in the latter type, refrigeration compressors become inefficient and bulky for small size applications. Fig. 1 - Distribution of electrons in unheated and heated material. Other useful items could also result from the new technology. In 1958, for example, Westinghouse announced a prototype of a device for heating and cooling a baby's bottle automatically and another device, a mobile hostess cart, has both refrigeration and oven compartments. Last year, two larger, full-scale devices were demonstrated. 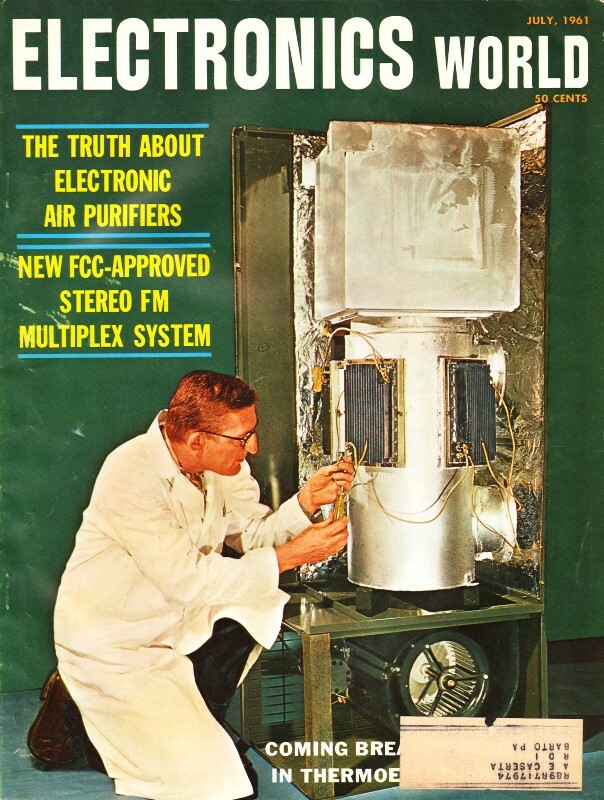 One was a household refrigerator of ten-cubic-foot capacity; the other, a "hot-cold-light" panel which combined thermoelectric heating and cooling with electroluminescent lighting. With such a panel, a home could be cooled in summer, heated in winter, and lighted the year round - all by solid-state devices having no moving parts and under the control of a few dials. Presently being marketed, is a line of thermoelectric components for cooling electronic equipment such as transistors. In addition, small heat pumps for both cooling and heating, based on the thermoelectric principle, are not too far in the future. Fig. 2 - Difference in charge in the material with one end heated. Thermoelectricity is actually one as­pect of a larger general search for new ways of generating power which involves the use of heat in a changing state, or thermodynamics. It is thus related to three other distinct, although allied, fields. One is a magnetohydrodynamic power, in which electric currents are produced by ionized gas that is blasted at speeds of 1000 to 2000 miles-per-hour through a magnetic field. Generators using this principle and producing up to 10-kw. output have been demonstrated. Another form is thermionic power, based on the electron flow from cathode to anode in a vacuum tube. 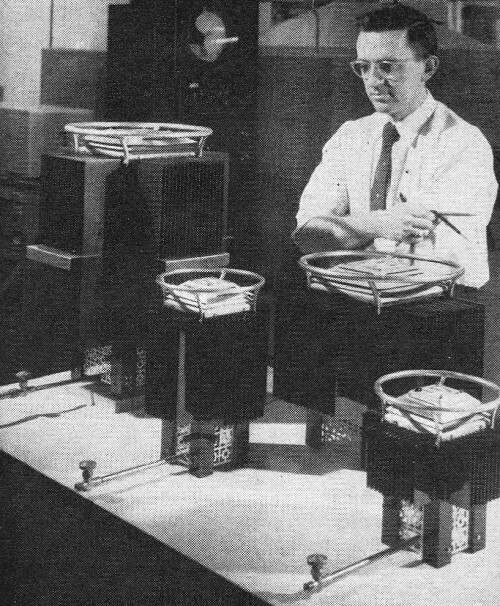 Special tubes, "thermionic converters," have been used to produce low-voltage power to do modest chores such as lighting an indicator lamp or running a small fan. In addition, combinations of thermionic-thermoelectric devices have been successfully tested to produce small amounts of power. Yet another form is the fuel cell, which generates usable electricity from the combined consumption of gases, such as carbon dioxide and oxygen, inside a high-temperature furnace. One such cell, resembling a large snare drum, heated to about 800 degrees C, has been said to produce 2-kw. per cubic foot. 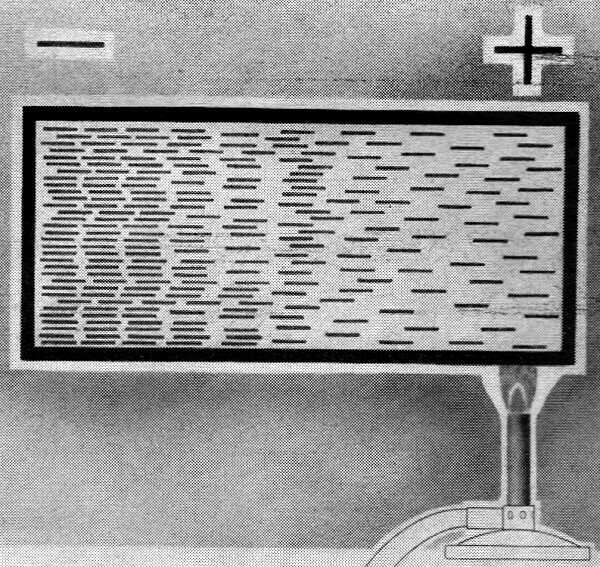 Of all these new methods, thermoelectric power generation is today the most well-developed and has, in fact, been used to build large and efficient "unconventional" generators. Thermoelectricity, simply, is a property of two different materials joined together and subjected to a temperature difference. A simple explanation of this is given in Figs. 1 through 4. In Fig. 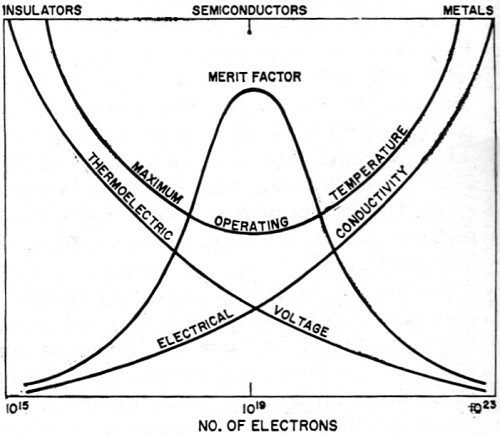 1, the left drawing represents material at uniform temperature; the distribution of electrons is the same throughout. As heat is applied (Fig. 1, right), electrons leave the warmer portion, tending to concentrate in the cooling area. As a result, the material becomes polarized, or charged (Fig. 2) with the cooler section being negative (more electrons). Fig. 3 - When two dissimilar materials are joined together and this junction is heated, the electrons are distributed as shown. When the free ends of the two materials are connected together through an external circuit, current will flow in that circuit. This is the principle of the thermocouple, which converts heat energy into electrical energy. To use this effect to do work electrically, a closed circuit is needed. As shown in Fig. 3, two dissimilar metals have been joined, and the junction heated. This causes differences in the distribution of electrons in each material. By connecting a wire between the unjoined ends of the materials, the circuit is closed and current will flow. This process is somewhat like the expansion and compression of a gas. Fig. 4 - Demonstration of the reversible characteristics of thermoelectric materials is shown here. The application of the proper polarity of electric current (from a battery in this case) produces the movement of electrons shown. As a result of this, the junction region of the two dissimilar materials is cooled. It should be noted that this explanation applies only to a metal-to-metal junction (thermocouple), which has a very low efficiency. Modern methods take advantage of the characteristics of both the n-type (electronic) and p-type (hole, positively charged) conductors. With these, it is possible to use a thermal gradient to produce, in n-type material, a charge gradient as shown in Fig. 2, and in the p-type material, a charge gradient of opposite polarity. In other words, the cold end can be charged positively. This is effectively adding potential, rather than creating a difference in potential (as shown in Fig. 3). With such materials and an understanding of semiconductor physics, it is possible to produce efficient thermoelectric generators. The thermoelectric effect, of course, can be reversed. If heat can be used to pump electrons, then electrons can be used to pump heat. As an electron moves through a material, it carries not only its negative charge, but its associated heat as well. In Fig. 4, a battery is used to send current through a thermocouple circuit. Again, the electrons build up at the junction and tend to expand across it. This expansion requires additional energy, which is extracted from the heat energy in the region of the junction. Consequently, the junction cools. If the direction of the current is reversed, the effect is reversed and the junction will heat. 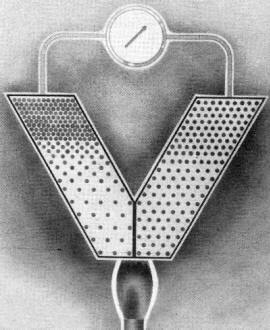 Thermoelectricity dates back to the "Seebeck Effect," discovered in Germany in 1821, when Thomas Seebeck observed current flow across a thermocouple. 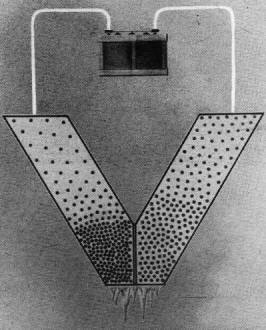 In 1834, the French physicist Jean Peltier gave a partial explanation of the phenomenon and observed the opposite effect: heat energy is absorbed at one junction and is liberated at the other (cooling and warming, respectively) when an electric current flows in such a circuit. This discovery is known as the Peltier Effect. Twenty years later, the English physicist, Lord Kelvin, offered the first detailed theoretical explanation for both the Seebeck and the Peltier Effects. Fig. 5 - Efficiency vs. power for conventional machines compared to thermoelectricity. One practical use of these phenomena has been in measuring temperatures. 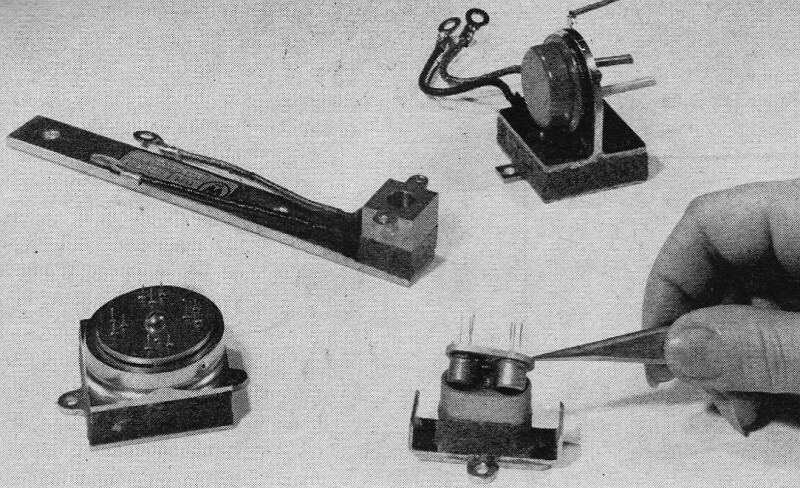 The voltage generated by a pair of metals, such as copper and constantan, is measured with a sensitive voltmeter. This voltage, which is a function of the temperature being measured, is typically on the order of a few millivolts for a difference in junction temperature of 100 degrees F.
Serious attempts to use the thermoelectric effect to convert heat to electrical power date back to 1885 and the work of another English physicist, Lord Rayleigh. However, for the next 50 years little progress was made toward realizing practical amounts of power. No known pair of metals permitted efficiencies beyond about one per-cent, too low for most use. Some limited commercial uses were developed; for example, the automatic safety pilot control on home gas furnaces and hot water tanks. But no large-scale applications were in view or even seemed to be theoretically feasible. The present-day "renascence" of thermoelectricity has been spurred by the pressing need for electric power in many new applications, such as in remote or undeveloped areas of the earth, as well as an active interest in the space around it. The new developments have been accomplished largely by the work in solid-state physics and semiconductors. With the combination, for example, of n-type and p-type materials described earlier, it is possible to achieve much higher efficiencies than before. Scientists forecast that the efficiency of thermoelectric generators in the next 15 or 20 years may reach a practical limit of 30 to 36 per-cent. 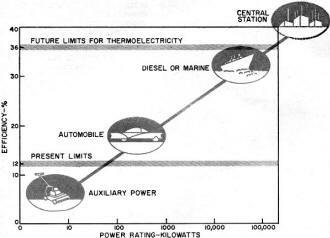 This is still lower than what today's turbine generators can produce, but it nevertheless indicates the extent of development in a very short time and points the way to foreseeable use of thermoelectricity in some areas of power generation. 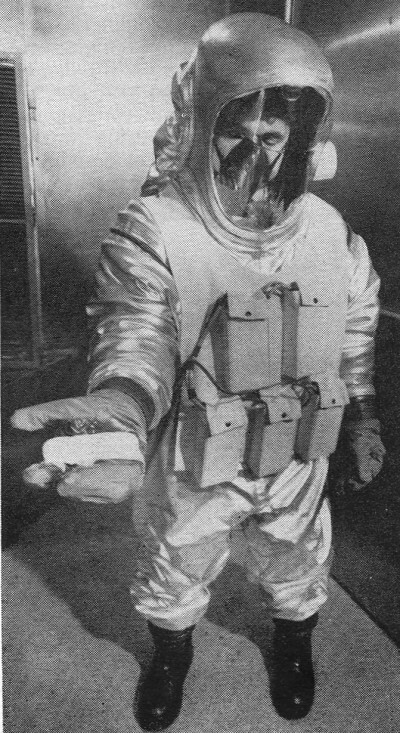 The 135-degree heat of the test chamber melts a stick of butter, but does not affect comfort of the man holding it. He is wearing experimental air-conditioned suit that keeps him at a temperature of 80 degrees F. A thermoelectric heating and cooling unit is fitted into the back of the suit; the battery pack in the front provides the power to make the suit portable. Because thermoelectricity is a simple and competitively efficient way to provide electrical power, one such use could be to serve as a peaking complement to a central power station. A modern, efficient power plant may have a thermal efficiency of 42 per-cent. This figure is made up of a thermodynamic cycle efficiency of about 45 per­cent and a generator efficiency of better than 95 per-cent. In a thermoelectric generator, much higher temperatures can be tolerated simply because there are no mechanical stresses on the material. This permits cycle efficiencies of 70 per-cent or better. As for generator efficiency, 40 to 45 per-cent is a reasonable-forecast. Thus, the thermodynamic cycle efficiency is the most desirable feature of a thermoelectric generator and the electrical generator efficiency is the more desirable feature of a turbo-generator. Four typical thermoelectric generators for industrial applications. These units are presently available and are representative of the range of such devices that can be produced. Fuels that supply the heat required for operation include propane or natural gas. Radiating fins on the outside keep the "cold side" of the thermoelectric material at a lower temperature than the heated junctions. The generators shown have outputs of 5, 10, 50, and 100 watts. Voltage outputs range from about 1.7 to 9.4 volts at operating currents of approximately 4 to 13 amperes. The following table shows, for heat rate only, the rather startling differences between thermoelectric and conventional power conversion systems. In the laboratory, thermoelectric generators delivering up to 5000 watts have been built. Their efficiencies range from less than one per-cent to about 10 to 12 per-cent. The calculated efficiency, based on materials at hand, is about 18 per-cent. The forecast, as stated earlier, is up to 36 per-cent, based on the ability to solve problems regarding materials. 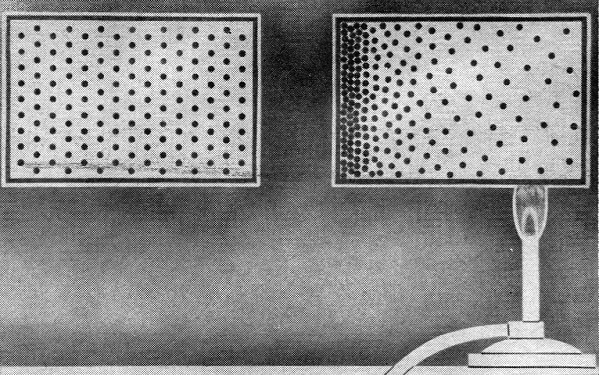 With the growing body of theory in this field, it is now possible to apply the "prescription blank" method of defining the composition of matter. This means it is possible to state a problem, consult the physicist, transfer his prediction of best composition to the chemist, and expect - and get - the desired property in the final material that is produced. Small-scale production line for final assembly and testing on several thousand thermoelectric couples which comprise the largest thermoelectric generator ever built. 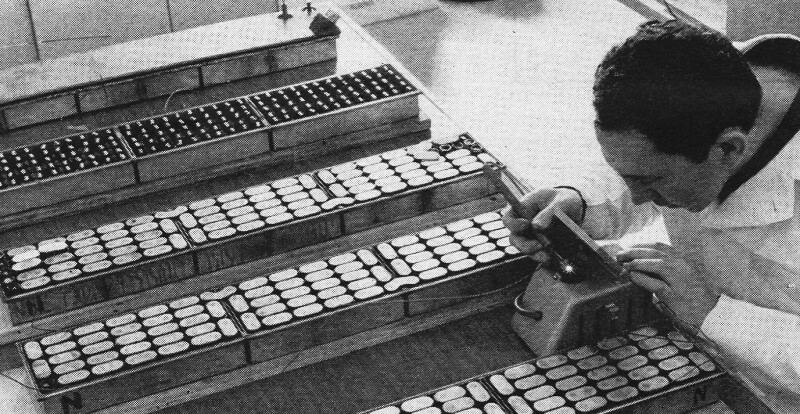 The couples fit into interchangeable trays which line the inside walls of a 5000-watt experimental Navy generator intended for evaluation of materials. 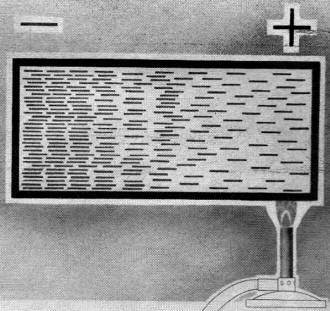 It should be pointed out, of course, that the thermoelectric generator is inherently a low-voltage, high-current, d.c. source. To be used, this d.c. must undergo inversion and transformation to multiphase a.c. To meet these needs, development of compatible static inverters is under way; indeed, inverter technology is ahead of generator technology at this time. Thus, the road ahead to efficient and economical power conversion seems clear. A convenient way of evaluating the competition for various generator tasks is shown in Fig. 5, which plots efficiencies under average use conditions of auxiliaries, prime movers, and central power plants. The slope of the curve is a function of three variables: economy, convenience, and geometry. Actually, geometry is the only exact criterion and refers to the well-known fact that the ratio of surface area (through which heat may be lost) to volume (which, as displacement, governs power) increases as smaller sizes are considered. This, of course, leads to increasing efficiency. The other two factors tend to depress the left side of the curve more than the right. In a thermoelectric system, heat leak is the only mechanism for power generation. Hence, the factor which reduces efficiency in small conventional heat engines is inoperative here. What is more, it is a fact that four thermoelectric couples give twice the power output of two. This increased output further substantiates the conclusion that comparable efficiencies can be expected whether the generator is rated at one watt or one megawatt. Thus, all of the area above the conventional power curve, but below the present or limiting thermoelectric curve, can be regarded as noncompetitive. The area common to both means of power generation must be decided on the basis of initial cost only, since there will be little difference in future maintenance costs. Thermoelectric cooling modules adapted with different mounting fixtures for cooling various sizes and types of transistors. These cooling devices are compact, provide a controlled cooling rate, are extremely rugged, and provide reliable operation. On the basis of capital cost, there seems little doubt that, in the absence of moving parts, thermoelectric generators can be built at a lower cost than their conventional counterparts. This fact would indicate their preference for use in many short-time or intermittent operations, such as peaking or emergency generator conditions. The one major problem in thermoelectricity today is to discover and develop suitable materials. In practice, successful thermoelectric junctions depend on a delicate balance of the properties of the materials used. This balance is among thermal conductivity, electrical resistance, and a special property called "thermoelectric power," i.e., volts-per-degree of temperature difference. Three general classes of materials must be considered. These are metals, semiconductors, and insulators. Their physical parameters, which govern their thermoelectric properties, are shown in Fig. 6. Fig. 6 - Physical parameters that determine the best types of thermoelectric materials. Metals have enough electrons to be very good electrical conductors, yet standard metals are too inefficient for either refrigeration or power generation. Semiconductors have an intentionally restricted number of electrons, which gives them their desired characteristics as a class of materials. They are the most efficient, although their efficiency does drop off with an increase in temperature and very high temperatures are needed for efficient power generation. Finally, insulators have so few electrons that they make very poor conductors. Yet insulators do have the highest thermoelectric voltage, a desirable characteristic for power generation. All told, semiconductors remain the most attractive class of materials for use in thermoelectric cooling and power generation. Present research to produce materials for thermoelectric cooling is based largely on the compound bismuth telluride (Bi2Te3). This formula, suitably modified, can demonstrate a heat pumping efficiency of 10 to 12 per-cent. However, because of mechanical properties, cost of raw materials, and other reasons, it has been replaced by a number of proprietary substitutes which have proven superior. Recently, Westinghouse scientists have discovered a new class of materials which promises thermoelectric power generation at temperatures of about 2000 degrees F. These are known as mixed valence compounds of the transition elements. From a junction efficiency of one per-cent, achieved shortly after their discovery, efficiency has risen to about ten per-cent. Such a value is practical for a wide assortment of small-scale, specialized applications. Eventually, junction efficiencies with these new materials are expected in the 20 to 30 per-cent range, which would be comparable to what is achieved with semiconductors. Beyond the question of materials are other factors that cannot be assessed at this time. Thus, it is impossible to predict just what thermoelectric devices and applications will be generally available-and when. On the basis of what has been accomplished up to now, and the continuing progress indicated by research, it does seem certain that these applications and devices will come, as welcome supplements to what we now have and as thoroughly new ways and means in our expanding electronic horizon. 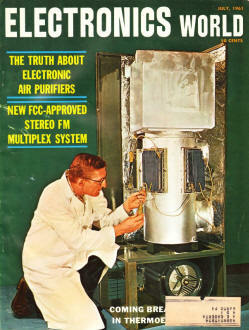 This month's cover shows an experimental setup that demonstrates a practical application of thermoelectricity. The photo shows a standard gas furnace including a burner assembly and a squirrel-cage blower and fan (at bottom of assembly). The furnace has been modified so that four thermoelectric-generator modules, each about 8" high x 4" wide x 2 1/2" deep, are mounted around the outside of the furnace combustion chamber. The "cold side" (free ends of the thermoelectric material) is attached to aluminum plates that are exposed to the air. The "hot side" (junction ends) of these modules is composed of a number of thermoelectric pellets whose surfaces are exposed to the air as it is heated in the gas combustion chamber. Therefore, heat is applied to the hot side of the thermoelectric materials and is removed through the cold-side fins. In doing so, the thermoelectric couples generate enough electricity to power the motor that can be seen in the base of the furnace. This motor powers the furnace blower. Hence, this gas furnace needs no conventional electric source to power the blower as other furnaces available today require. This furnace is an experimental unit being developed by the C. A. Olsen Mfg. Co. and is not available on the market today. It does, however, give an idea of the kind of exciting applications available from the new science of thermoelectricity.